Octavia our British Lop gilt is now officially a sow as she has had her first litter. 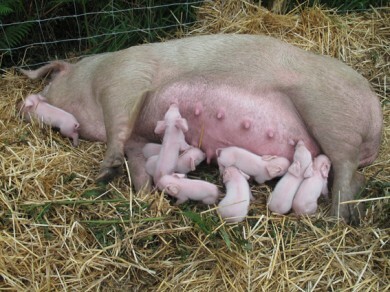 Nine were born on Saturday afternoon, outside in the drizzle. She has a lovely farrowing arc full of fresh straw but could not be persuaded to birth in it and she spent all of Friday and Saturday morning collecting bracken and moving the straw to make a big circular nest out in the field. All nine were born within about an hour, each one being moved inside the arc to keep warm. 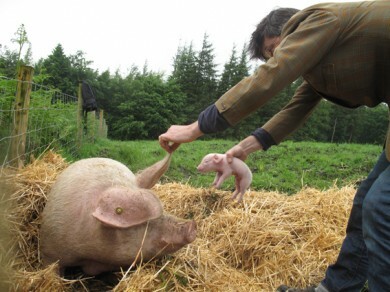 It took another hour or so for her to deliver both afterbirths and another couple of hours before she would move into the arc with the piglets. 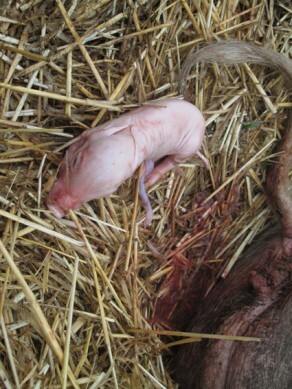 She unfortunately rolled on one on the first night, a common occurrence in the first few days as the piglets aren't so fast to get out of harms way. We have 8 left, 3 girls and 5 boys. We'll have to tattoo and register them in the next few weeks and get out local Lop expert Carole Barr to have a look at them. There may be some in the litter which are good examples of the breed (relating to ear shape, length, number of teats etc) worth registering which we can sell on for breeding. The rest will be growers for meat. We will probably keep a couple as growers as the meat will be a good supply for Lawson Park and the Honesty Shop in the village. If anyone wants to buy a rare breed British Lop, or some of our pork, please contact us!